Jefferson Lab manages its regulated medical waste to minimize personnel and environmental contact. This appendix describes how Jefferson Lab handles and disposes of this type of material. o Detached tissues, body parts, etc. o Any solid waste or residue (e.g., needles, syringes, cloth, soil, and water) contaminated by or mixed with blood and/or other potentially infectious material. · Read and comply with regulated medical waste warning labels. · Do not handle regulated medical waste or waste containers, unless trained and authorized to do so. · Contact Occupational Medicine (x7539) or Industrial Hygiene (x7882) for assistance with blood and/or other potentially infectious material response. · Ensure that Bloodborne Pathogens Protection Program training is current and in accordance with Occupational Medicine’s standards. · Use engineering and work practice controls to prevent exposure. · Isolate areas where exposure is likely to occur and mark the areas with signs and/or barriers indicating limited access. · Use appropriate personal protective equipment (PPE), engineering controls, and work practices when performing the process steps outlined below. · Transfer all containers of regulated medical waste to Occupational Medicine within 24 hours of collection. · Package, label, and handle any residue, soil, water, or other debris from cleanup of regulated medical waste in accordance with 9 VAC 20-120 Regulated Medical Waste Regulations. · Maintain and provide Bloodborne Pathogens Protection Program training. · Maintain an internal tracking log of the regulated medical waste generated at Jefferson Lab. · Ensure that regulated medical waste is packaged, handled, and disposed of in accordance with 9 VAC 20-120-10 et.seq Virginia Regulated Medical Waste Management Regulations. · Ensure that spill containment and cleanup kits are provided where and when regulated medical waste is produced. · Evaluate radiation exposure of employees involved in blood and/or other potentially infectious material cleanup. · Evaluate regulated medical waste for radioactivity content and provide guidance regarding appropriate disposal of any radiologically contaminated material. Only individuals trained and authorized by Occupational Medicine (i.e., Industrial Hygiene and Occupational Medicine staff) handle regulated medical waste in accordance with 9 VAC 20-120-10 et.seq Virginia Regulated Medical Waste Management Regulations. 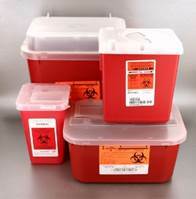 Step 1: Collect sharps (e.g., needles, needles with syringes, blades) in rigid, red containers that are highly leak and puncture resistant and labeled with the universal biohazard symbol (see Figure 1). 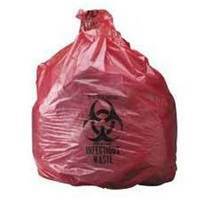 Step 2: Collect other regulated medical waste in leak-proof, red, plastic bags labeled with the universal biohazard symbol (see Figure 1). Step 3: Turn containers in to Occupational Medicine for disposal. · For Sharps: When a sharps biohazard container is full to the “Fill” line, it is placed in a properly labeled, approved biohazard box. 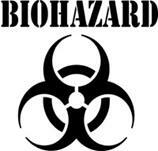 · For Non-sharps: When non-sharps have been collected the container is placed in a properly labeled biohazard bag. The bag is then closed and sealed to ensure that no liquid can escape. · Subcontracted Transporter: Registered with the Virginia Department of Environmental Quality (DEQ). See ES&H Manual Chapter 3410 ES&H Aspects of Procurements for requirements. · Health Care Professional or Authorized Subcontracted Employee: Regulated medical waste is packaged in accordance with 49 CFR 173.6 Shippers – General Requirements for Shipments and Packaging, Materials of Trade Exceptions and transported directly to a treatment or storage facility in a Jefferson Lab or privately-owned vehicle. · United States Postal Service (USPS): Occupational Medicine coordinates transport of regulated medical waste through USPS. Packaging complies with 39 CFR 111 General Information on Postal Service. · Delivery confirmation and return receipt are kept with the internal tracking log. · Jefferson Lab maintains records of its regulated medical waste inventory and tracks it from the point of generation to disposal.